Mel: Hi welcome to episode number 64. My name is Mel Telecican I am your host and today I am speaking with a lawyer who is really shaking things up in the industry and has been for some time and recently was awarded by her peers as thought leader of the year. 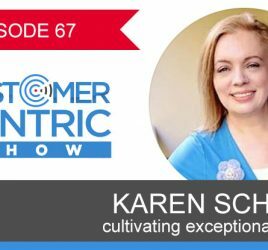 She is really changing the client experience and in an industry that is typically very traditional, it is really fascinating story about what she does and how she does it and how other people sitting up and taking notice as a result. Clarissa: Hello I am Clarissa. I am the Director of Brisbane Family Law Centre and I am also known as ‘The Happy Family Lawyer’. 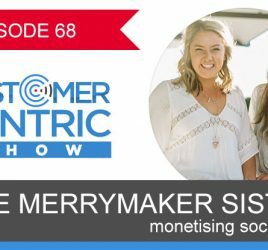 You are listening to the customer centric show with Mel Telecican where we talk with successful business owners and experts to share smart ways to attract more customers, profits and freedom by thinking customers first. Now, here is your host Mel Telecican. Mel: Clarissa Rayward, is the Director of Brisbane Family Law Centre. She’s also known as ‘The Happy Family Lawyer’. I invited Clarissa on the show because she is an example of how, even in an industry like law, there is a better way. A way can do things differently to the benefit of the customer, or in this case, the client. As a Divorce Lawyer, Clarissa specializes in helping separating families stay out of the Family Courts and stay friends as she believes that a divorce can be a positive end to a marriage. Over the past 13 years Clarissa has worked as a specialist family lawyer and has helped over 2,000 Australian families through their divorce. That experience has reinforced her belief that traditional legal processes do little to help separating families find a positive future after divorce. She believes it takes more than lawyers and Courts to help families through divorce and separation in a way that ensures a positive end to a marriage. For this reason she established Brisbane Family Law Centre, a multidisciplinary practice where lawyers work alongside counsellors and financial planners to ensure that clients receive the holistic support they need at such a challenging time like that. Clarissa is determined to change the way Australian families experience divorce and separation for the better. She is known as ‘The Happy Family Lawyer’ because she believes that a divorce can be something you can look back on with pride. So for this reason I’m excited to bring you Clarissa who is a good friend of mine, to share with you the importance of thinking about the client experience and outcome above and beyond what is the traditional approach. So thanks for joining me today Clarissa. Clarissa: Thanks so much for having me. Mel: Now let’s talk about your example as we do every episode of a customer centric business. Is there anything that brings to mind for you? Clarissa: So I had to think about this and I got on so I am really happy with that hah. My first example and just few weeks ago I was up in Townsville doing some teaching and they started the client hotel I want to give them applaud in Townsville and good lovely hotel. Nice and clean and usual. Nothing remarkable though about the hotel itself. It is a nice hotel. But their service and what did make it remarkable for me was their service because we have those classic occasions where you have been doing business where you have to check out it is 10 am but you are not leaving Townsville and it wasn’t until about 10 pm that day and they come back to the hotel after we have done our day at work. Use their facilities, leave our bags there. They really went out of their way to make our whole experience there. Then when we checked out it was really great and I myself been talking about ever since anyone I met but I know I might do business in Townsville because it really was something that I haven’t experienced in a hotel for such a long time. I mean you checkout and they look after your bags. Best of luck using the shower something like that later in the day. That’s one example. Mel: Wow that is great. So do they allow you access to the room? Clarissa: They allowed us access yeah. There is some facilities there that they have included the shower and other stuff which meant we can do silly walk to the top of castle hill in afternoon get little hot and comeback have a shower and yeah it made such a difference. Mel: That is great so yeah that element of surprise like I guess is the fact that you actually ask for that. Did someone ask or offer it? Or how did they come about? Clarissa: I think one of the guys that I was travelling with just made the comment that we were there at really long time and it would be nice to still sort of do some stuff rather in Townsville the hotel I think that was the owner/manager said that’s okay we got showers here you can use them. Just kept saying we will give you all the stuff. I must say I don’t go to Townsville a lot but I know that when I do I make the effort of staying in that hotel because of that. That’s the links they went to. Mel: Fantastic. Good Stuff and you said you got others on that list. Who else you thinking? Clarissa: My first is well I am a mad coffee lover so every morning my daughter and I go to same coffee shop around the corner in our house and it is amazing and what makes it amazing is the staff or goals that work there. They are like my friends now and know probably more about me than my friends because I go there every single day hah and that’s what makes that experience amazing because it is probably 4 coffee shops in distance but I go to this one and the coffee is good but it is that capacity to have a five minute conversation in the morning with someone who genuinely seems interested in what you are doing and something that just reminded me is on Saturday I got a good morning written on my coffee cup by Tyler who works there who has become friend of mine. In Instagram I posted it and said thanks so much Tyler for my good morning and Tyler then engage with me on Instagram and it just was a reminder to me because I love social media. 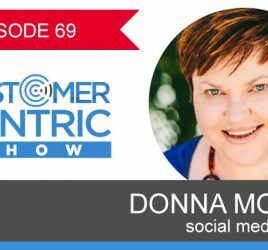 It is a big part of my business and I always make the effort when people are engaging on social media to engage back because I think it is customer, client or someone that’s connected with your business takes the time in the effort to engage in that sort of positive and public way. It is so worthwhile to engage back and I do that as a customer all the time for business and it always amazes me how many businesses just never engage. So you might be throwing public comment and I always do things positive and never do any negative and we just met here and everything versus the time and the effort to come back to you and say just anything whatever it might be makes a big difference. Mel: Absolutely and so does Tyler you know typically look after the Instagram account? Is it something she manages? Clarissa: No she came back with her own personal account and that was really nice and sort of personal relationship. Kudos to guys who run this coffee shop because they really got a great team down there who are creating customer service without serving to be part of it. Mel: Like you say there is competition there and they are all doing great coffee then that’s the differentiator isn't it? it is that connectivity and the thoughtfulness and I guess there is another example though the purpose for staff to be connected to you know there are obviously element of pride to what they do that they actually would be filling their business they work for, their Instagram account but actually to be looking out for those sort of things that is fantastic. Good example. Thank you for sharing that one as well. Both hospitality business based ones and perhaps that’s a big area is in Australia that we don’t have is brilliant experiences and there is some good examples of where is being done really well. So perfect. Thanks for sharing that. Mel: Yes they are but it is that stopping and taking time and thinking it through I guess having the right people onboard. Now let’s talk briefly around why you took this approach? I expect it would be easier for you to start a family law practice that was just like the others and it is traditional and I guess falling the same way everything is always been done but instead you have taken a different park. Can you give a bit of reason to what led to that? Clarissa: Absolutely and I think in some way it is a selfish reason because I started early in family lawyer. It really started to take a toll on me watching what was happening to the people I was working with and families I was working with. The impact of a traditional legal process. What that often means is families find themselves in family courts, that’s very expensive process. Both financially but also emotionally expensive and so for me as young lawyer it started to take a toll on me as well because I didn’t feel like I was doing a good thing in this world. I was sort of looking and thinking wow I am part of potential problem and that’s not all what I went into law for. So by setting up a business that focuses on keeping families away from the courts and ideally finding positive ends to merges is personally family satisfying but I see that for the families I am working with, the outcomes are so much better. the cost and emotional cost are lower and when we are talking about families we are talking about children, we are talking about parents having ongoing relationships with children for literally the rest of their lives so the work that I do I am pretty privilege to do but it can have some positive and significant impact in a very negative way as well. So I was looking for a way of working with families going through divorces, separation that would minimize the overall potential harm that they might experience. Mel: So as a service already you I guess helping solve a problem that exist. You are looking for people who separate a divorce trying to figure out customer arrangements, property arrangements and things like that but then you have taken the next step of going and look where is actually a problem within this system as well and how we do things because the end user or the end client the people who are going through this are finding this difficult, the children are finding it difficult and so you have taken it. Is it called collaborative practice? Is that how it is totally? Clarissa: My business is sort of really modeled around a form of law that’s called collaborative practice to anyone that practices in more to average person that has nothing to do with law. I would describe it by saying it is almost common sense why I am solving a problem in that. You sit down and you really try to understand what the cause of the problem is? What are potential solutions of the problem and you are looking at a win. Outcomes that meet the needs of everyone at the table rather that applying pure law which law gives the answer and sorry if that answer doesn’t suit you, your life, your children, but that’s the legal answer. So we are looking for balance between what a families might themselves think what is the right thing and balancing that with the law by putting the families own goals and values ahead of what the law might say is the perfect and legal outcome in any situation. Mel: Okay good stuff. so in terms of then attracting people to your business because we always talk about the ways we can attract more customers to have business so for you I would expect that may be a lot of people would be coming in your direction because of doing it this way or would that be wrong? Clarissa: No that’s right and so it attracts a particular type of client. There are people that obviously as you said experiencing or thinking about separation or divorce and they are looking for respectful dignifying solution. So that’s the sort of client that I would describe as my ideal client and that is genuinely attractive to this business. Mel: Okay and so do you have people that would inquire because you are and given your business name that’s Brisbane family law center. Doesn’t seem to differentiate itself in the title. Do you get a lot of people coming in perhaps not actually knowing that this is the approach you prefer to take or they all come in based on knowledge of your approach? Clarissa: Yeah I would say far less off the first option in terms of people just sort of going on what sort of coming because of name I think in this day and age in my industry clients are more than ever before and it would so rare for someone to come here without already done some online research and so most people would come as a result of two main avenues to my business. The first is personal referrals or alternative way through the website and the website is very much structured to be very clear for what we are about and what our business is about and type of service we offer. So I think if you are a client that is seeking what I would call a more traditional lawyer, you probably spend two minutes of my website and go. So I very rarely these days see people that don’t have some knowledge of the firm before they come in. Mel: Great so that personal referral side of things, would you have any figures around how significant that is in terms of your new clients coming on board? Clarissa: It is probably equal between online referrals and personal referrals. So it is round about 50/50 but that’s become more equivalent because I got much better work presence now than I would have for 6 years ago and I think as consumer based people using online resources to source things like as much more than they have had before. So it is not that my referrals have dropped off in that sense I think it is just number of leads coming into the business in increasing each year and I am seeing that majority of that increase coming through online sources. Mel: Yeah so let’s talk about website for one because when I didn’t mentioned the intro is that Clarissa is an author and she published splits fill. What’s the bottom line? Can you share with us? Clarissa: Yeah certainly have to separate, stay out of court and stay friends. Mel: Yeah so that’s one of the I guess significant pieces of content that you created but on your website you have also got quite a lot there too. So how important is that for your type of business and what sort of information is on there? Clarissa: Yeah so I think this is massively important and working in legal profession, it is pretty static industry that really is struggling to move at the times when it is only just starting to move with the time. so it is been a little bit sense of clear open model for me in terms of website and being able to attract online leads, my firm website has organically become sort of number one on google for most of search terms which is great and that’s been a huge thing to achieve. I have got 2 sites. I have got Brisbane site and I got my personal blog brand site and both feed back into my core business here and so content wise I sort of have everything. I have obviously articles, I have video, and there is podcasts that I have been involved. There is a lot of stuff and my approach in the online world and in business has just been give and it ultimately returns. Mel: Yeah and that’s what people are looking for and everything you engage with lawyer it is stressful in some capacity and so being able to have those resources there for people to consume and to feel confident with their decision is going to position you if it is what they want is going to position you above your competitors for that reason. Clarissa: Yeah and I think as an industry again, lawyers have been one that is reluctant to give information. There has been a few around if I give too much I may been giving away the long health secrets of my intellectual property. The irony of course not is thanks to google everything is online. You can go and read every decision out of court of Australia for the last 10 years if you feel the need online. So for client there is no ended information to access and my approach is been to try and take what can be very complicated information break it down into easy way. Mel: That’s exactly what I was about to say that you do really well is actually frame everything enough and that’s a mistake a lot of people make across industries is that they talk in industry job which doesn’t actually help the situation so that is something you do really well and clearly connects with your audience or potential clients. Clarissa: Yeah and I enjoy writing that too. Think about the industry job and for long hours I wouldn’t write as much as I do but that is what I can sit and break it down into just common language that you and I use that make it much easier. Mel: Absolutely. I think that conversational tune is really clear. Whenever I do read your blog articles I do think yeah that just sounds like Clarisse as if she was speaking so to have that I think creates that trust as well for the reader who is someone who doesn’t know you so well done that’s really fantastic. So referrals are important and then being able to connect with people through that helpful content is what is driving business that’s great. Let’s talk about starting a law firm and I guess taking a different approach too is probably not the easiest thing to do. So what would you say in your years of running your business has helped you maintain a level of profitability to keep things changing along nicely? Clarissa: So my simple answer to that question is to always be trying things and always be testing and measuring whether that’s working. So I think when I first opened the firm I had this motion that you opened the business, you sort of got people in and six months’ time it just being tinkering and I go to the Bahama or something hah that was visual of what life is going to be like and of course with 6 six months I knew quickly that so not what happens when I started the business and so for me it is not thinking this place as static but always thinking of potential for improvement, potential for change. The business world is changing so much at the moment. So always looking for different better ways to do things efficiently. That’s my big guiding principles when it comes to business. Mel: Having known few lawyers in my time I probably wouldn’t have thought the profitability would be. I probably would have agreed with your Bahamas I guess project about where things would be going as well but let’s talk about fixed fees because a lot of businesses and law are starting to talk about it and of course there are public liability that say no. obviously there is a ratio that comes into play when people do win but so all of that comes into play with profitability do you think this move towards fixed fee is a good measure for business because I think the profitability would be there not in a fixed fee? Clarissa: I think that’s part correct. If you think of a traditional time based building model that many firms talk right under. It does in itself encourage a level of efficiency so it does encourage people to work as you getting paid by the hour so doesn’t really matter if I rush this or not. And it also sadly can encourage a situation where the longer the file work the longer the client is client of your business obviously the money and business potential they can make out of them. With my model one of the challenges that I faced doing work that it tends to be average cost or particular client to be far less than that particular client they are in now in traditional firm. So I need far volume to maintain my business. So for me it is about ensuring that we have more clients but therefore charging them a lesser amount per client and the beauty I found with fixed fee is that it forces us as a group of professionals in my business to focus on proficiency and doing things. yeah efficiently and quickly and really looking at what actually needs to be done on a particular client and it also enables us to give quotes to clients but might say look for this particular level of service, this might be price versus if this is the level of service that you think you are comfortable with and you are willing to do a large amount of this by yourself then the price might be different. So for me it is taking a while to be able to make that shift but I have really enjoyed it. I think it is so much easier as a business owner because it gives you clarity. You can predict your future cash flows with a lot of clarity versus working on hourly rate because that’s my lawyer with certain amount that we might recruit but you never really know. Mel: Unless you set targets differently and I would also think that perhaps as a staff member that the fact something can be drawn out which cannot be what staff member control but that you actually get through the process faster if there are some constraints around time frames, knowing on past history of how things would normally map out. Clarissa: Yeah that’s right. I think also for team members and for people working on law firms what I have seen with fixed price is it takes a big money off their back so it is not nice if you are an employee and whole day is being recorded in 6 minutes and in the end of the day you sort of step back and go oh i haven’t done much work today and by boss is going to be asking me questions about that. it is very different thing when you don’t have to record any of that and your day is purely about getting your task done and if you took all day to do it then so be it but still get it done by Wednesday. Mel: So productivity is not negatively impacted. Okay great. Now going to move onto freedom. So as business owners I speak to people for the show, we always have a conversation around what can be done to be able to spend less time I guess in the business and more time working on the business. If you got any tips that you can share with us what has been worthwhile for yourself helpful for you? Clarissa: It is all about team. Having people on your business that can particularly manage the operations. For me that is obviously lawyers that do legal services and the better lawyers are having the better quality if legal service they are able to provide means they are signing to be involved in that aspect of the business which then freeze me up to be purely on working on the business and really the strategy focusing on bringing in leads. All of that sort of thing. So that wasn’t something I was able to achieve in the first 6 months of business. That has taken me different methods with different types of stuff but I am touching my distance. That freedom probably comes from having a great team sitting with you. Mel: Hmm and so when you open the firm how long did it take? Did you start with team of staff or did you slowly onboard? How did that unfold? Clarissa: I did start with the team that was of myself, my PA, she was there in the part time capacity and we had a receptionist as well. so that’s more team versus now I think I actually don’t know how many people work here but it is round about 11 part time and I got all these unusual work rate that is going on. Mel: And you actually got people who work remotely too haven’t you? How does that work? Clarissa: It ironically work so well. Our team member she got remote access. She has been here in Brisbane so she flew up to do mediation today for client she has been assisting. It has worked seamlessly and because she is amazing. So she is someone that I trust wholeheartedly. She is a great person. She is studying where she is now so she is working part time for me and the capacity obviously is someone can work from anywhere from the country potentially anywhere in the world thanks to technology has really opened my mind and to potential opportunities with my business now moving forward. Mel: Yeah that’s fantastic and so when you take on a new lawyer. How do you know when to take that leap into take on extra people? Clarissa: Hmm so my approach maybe isn't the best one hah. It has been person isn't available and someone seeks out a job and I think you are a great person and you are potentially really brand aligned and I want to grab you now. So I always been someone as an employer that looks like a good investment in the future and therefore come into my business and the majority of time has worked really well but other times it is really and trying to set team with right numbers. So I think I do a lot of intuition when I am hiring people and in business decisions generally. Mel: Yes and you do it very well so as an outside looking in those have been really fantastic choices. You got a great team there. Now can you share with us some project that is coming up that you are working on? I did forgot to mention the part of what you do is an addition to blogs is you got workshops, online webinars as well. Clarissa: Yeah I do so that’s something under the happy family lawyer brand that I do like to try to do on monthly basis. So I do workshops here in Brisbane for people that are just thrilled I guess seeking information about the legal process when it comes to divorce and separation and so they are really east coast price. 25 dollars. Easy for most people to access. I enjoy doing that because that means people may not be able to afford the full gamble of legal services and it can at least get it on the descending of the legal process and what they need to know. A lot of people can then go and manage big parts of their own divorce process by themselves and then I also offer online webinars so I have got one of those coming up in 2 weeks and all different topics. Lately I have been trying to pull in a lot of my friends in this divorce space. So one on June is psychologist Maria who has done years of work with families and with people. She is going to talk us through things that you can do look after and make the whole process just emotional perspective a lot easier. I love webinar because they are so easy to put together but obviously people obey their country. Such a great way for me to learn and then record it so that’s the resource that I can use moving forward particularly with clients and friends. Next time someone comes in and I think most people would be struggling all have that webinar and I can say here is something that give you some medium resources of things you can do to make things easier for yourself. Mel: That’s fantastic and do you do Q and A live when you do webinars? Clarissa: Yeah definitely. I make it compulsory because I make them free webinars that is compulsory for everyone online. It is nice to know who is listening. I do webinars for lawyers based on who are my friends. So absolutely there must be compulsory questions hah. Mel: Yeah I guess they are burning questions that perhaps can be a topic further next webinar I guess essentially and so I know that you are working on a second book. Do you care to share with us what that topic is about? Clarissa: Yes certainly so sort of quarter way through at the moment at this point called happy lawyer happy life. How to be happy in law and in life. Because we got real problem in profession of unhappiness and at a serious level people suffering from depression and anxiety and the Australian studies are showing that one in three lawyers in some point of their career would probably suffer from depression and anxiety. That’s just too significant for me to be comfortable with so I guess I am trying to write a little bit of my own story when I started the blog happy family lawyer. I wasn’t the most wonderful hit space either and what I found is it forced me to think about happiness and think about what that means and as a result a lot of lawyers get in contact with me. I am trying to write a pretty practical book that is aimed at professionals but particularly lawyers that may not be entirely that depressed in a very serious place but I just potentially go in that way or potentially just unhappy and really trying to give those resources line. How you can survive in this industry which isn't always the easiest industry to be part of and be yourself and have a life and live a real difference in life in time. Mel: And good for employers too I expect because for whatever reason it is good to know what people that you employ could be going through this part of journey when they are this pressures and perhaps tuning into that can actually help you counter it. Clarissa: Definitely and myself as an employer certainly when I started this book I started bit of talking challenges here around help for happiness because I thought I cannot go out and have potentially none happy offers hah. We have great workplace and happy people but I know I have my own merits where I am not happy and I had one of those only last week and I think it is important both as leader and organization to acknowledge that you cannot be smelling roses and jumping around every single day. That is moments in life where for whatever reason people are not going to be that great and having a really positive dialogue around that for me it is literally acknowledging itself and then writing about it. That’s how I process that but I encourage that with the people working with me that when things whether things outside of work, I reflect in them that they try and openly talk about it as much as they are comfortable with because it is normal. It shouldn’t be seen as abnormal it is normal. Mel: Hmm and it is more likely to be manageable I guess if it can be talked about. Sometimes it is sharing right. It is helpful way of doing it. Clarissa: today life is not happy for me and you don’t have to tell me why but at least as employer and friend and someone working with you right now like okay let’s not make it that particular thing today because that’s going to work that off. Mel: I like it good stuff. So Clarissa if people want to find you, follow your work or your practice as well, where can they find you? Clarissa: So online is my favorite place obviously and if you interested in silly photographs of me and my daughter then it is Instagram and it is my favorite place to be which is the happy family lawyer but website wise thehappyfamilylawyer.com is my main active website and then businessfamilycenter.com.au is the capacity define the law firm and I am also huge fan of Facebook so I am pretty describe myself and honor and happily share my stories and my life hah. Mel: You got a nice balance of work related things and laugh because as happy family lawyer brand I guess is explaining. There is more to life than work. So there is nice balance of things is definitely shown in your social media. Clarissa: Hah that’s exactly and photographs and pancakes and I think to be happy in life we have to be like a whole person and work not as part of whole person but whole lot. Everything is what makes each other up and that’s a beautiful thing and it should be celebrated. Mel: Congratulations on taking on what is not the well-known path at all and I am sure it is challenging but also thinking beyond what I guess is tradition and making sure the outcome is best for everyone around. You do whatever they found is fantastic job and your team does as well so thanks for sharing with us on the show today everything that you are doing and best of luck for the second book. Great to have you. Clarissa Rayward, is the Director of Brisbane Family Law Centre. She’s also known as ‘The Happy Family Lawyer’. I invited Clarissa on the show because she is an example of how, even in an industry like law, there is a better way. A way can do things differently to the benefit of the customer, or in this case, the client. As a Divorce Lawyer, Clarissa specialises in helping separating families stay out of the Family Courts and stay friends as she believes that a divorce can be a positive end to a marriage.Over the past 13 years Clarissa has worked as a specialist family lawyer and has helped over 2,000 Australian families through their divorce. That experience has reinforced her belief that traditional legal processes do little to help separating families find a positive future after divorce. Clarissa believes it takes more than lawyers and Courts to help families through divorce and separation in a way that ensures a positive end to a marriage. For this reason she established Brisbane Family Law Centre, a multidisciplinary practice where lawyers work alongside counsellors and financial planners to ensure that clients receive the holistic support they need at such a challenging time. Clarissa is determined to change the way Australian families experience divorce and separation for the better. She is known as ‘The Happy Family Lawyer’ as she believes that a divorce can be something you can look back on with pride. So for this reason I’m excited to bring you Clarissa who is a good friend of mine, to share with you the importance of thinking about the client experience and outcome above and beyond what is the traditional approach.